This very peaceful dwarf cichlid is ideal for any planted community aquarium housing species such as tetras and gouramies. 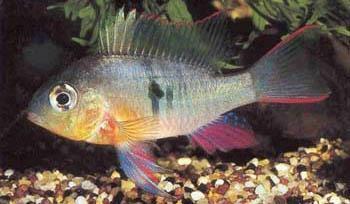 Native to Bolivia and Brazil, nowadays most stock in the aquarium trade is commercially farmed. Bolivian Butterflys grow to about 8cm, both sexes are very similar in appearance. Most standard aquarium foods are eaten, but they also appreciate regular feeds of live or frozen foods.